Brain injuries are one of the most common, serious and debilitating impairments that can arise from a car accident. Here are some different types of traumatic brain injuries that can happen during a vehicle collision and how you can get the medical care and compensation you deserve if another driver’s negligence played a role in the crash. A concussion is a form of brain injury and is frequently seen after car accidents. This is because concussions are commonly caused by a sudden change in movement or blunt trauma to the head, which typically happen during a car accident. Victims who have concussions may experience a loss of consciousness, but they may also feel dazed. Confusion, vertigo and balance issues, nausea and changes in behavior or thinking patterns can last for days or months. Brain bleeds, also known as contusions or bruises on the brain, are another common brain injury caused by car accidents. However, these injuries tend to be more serious than concussions. While small brain bleeds can resolve on their own in time, larger bleeds may need surgery. If a bleed is not detected in a reasonable amount of time, it could be fatal. This type of injury is common with car accidents because of the force and sudden stop in movement that occurs when a car collides with another car or a stationary object. With this type of traumatic brain injury, the force actually causes the brain structures to tear and brain chemicals to be released, which can have serious, debilitating and sometimes fatal results. 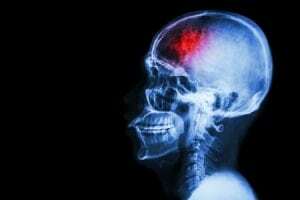 Perhaps the most serious of all car accident-related brain injuries are penetrating head wounds. Debris and other objects from a car crash can lodge in the skull and brain with the force of the collision. These injuries are always treated surgically. The amount of damage done and prognosis can generally only be determined after surgery. In severe cases, the prognosis is poor. Victims who suffer a penetrating brain injury may have permanent disability or may lose their life. Were you or a loved one the victim of a traumatic brain injury caused by a car accident? Don’t hesitate to speak with a lawyer to discuss your case and to determine what kind of financial compensation may be available to assist you. A claim will help you obtain the medical care you or your loved one needs and get your family back on the right track. We help you navigate your way and take all of the work off of your shoulders so you can heal and recover. Call Shulman Rogers today for a consultation at 877-229-1515.